Since it’s inception in 1973, Colonel Sander’s Kentucky Fried Chicken has provided humans with a road-cross worthy family-themed restaurant that fills tummies with hearty chic meals, made with a secret recipe that includes a mystery blend of eleven herb and spices. Aside from crafting signature juicy and tender chicken, the 500 outlet strong fast food chain also started the Tabung Penyayang, a program that supports thousand of orphans and underprivileged children with shelter and food as well as ‘Meals on Wheels’, a delivery service that shuttles finger-lickin-good meals to fried chicken craving individuals. Coffee Lovers! 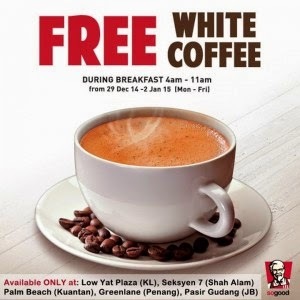 KFC is giving you a treat of FREE White Coffee during breakfast (weekdays only) to the first 100 pax! NO purchase required! Head over KFC to redeem your free White Coffee from 29 December 2014 to 2 January 2015, 4am – 11am at selected KFC outlets in Malaysia.